Baicalein, a flavonoid extracted from the roots of Scutellaria baicalensis Georgi., has various pharmacological effects due to its high antioxidant activity. However, no study has yet been conducted on the protective efficacy of baicalein against oxidative stress in Schwann cells. In this study, we evaluated the protective effect of baicalein on DNA damage and apoptosis induced by hydrogen peroxide (H2O2) in HEI193 Schwann cells. For this purpose, HEI193 cells exposed to H2O2 in the presence or absence of baicalein were applied to cell viability assay, immunoblotting, Nrf2-specific small interfering RNA (siRNA) transfection, comet assay, and flow cytometry analyses. Our results showed that baicalein effectively inhibited H2O2-induced cytotoxicity and DNA damage associated with the inhibition of reactive oxygen species (ROS) accumulation. Baicalein also weakened H2O2-induced mitochondrial dysfunction, increased the Bax/Bcl-2 ratio, activated caspase-9 and -3, and degraded poly(ADP-ribose) polymerase. In addition, baicalein increased not only the expression but also the phosphorylation of nuclear factor-erythroid 2 related factor 2 (Nrf2) and promoted the expression of heme oxygenase-1 (HO-1), a critical target enzyme of Nrf2, although the expression of kelch-like ECH-associated protein-1 was decreased. However, the inhibition of Nrf2 expression by transfection with Nrf2-siRNA transfection abolished the expression of HO-1 and antioxidant potential of baicalein. These results demonstrate that baicalein attenuated H2O2-induced apoptosis through the conservation of mitochondrial function while eliminating ROS in HEI193 Schwann cells, and the antioxidant efficacy of baicalein implies at least a Nrf2/HO-1 signaling pathway-dependent mechanism. Therefore, it is suggested that baicalein may have a beneficial effect on the prevention and treatment of peripheral neuropathy induced by oxidative stress. Schwann cells are the major glial cells of the peripheral nervous system and support the normal physiological functions of neurons. They play a critical role in the onset and development of peripheral neuropathy [1,2]. Oxidative stress, characterized by overwhelming reactive oxygen species (ROS), is a crucial initiating factor in many chronic diseases including peripheral neuropathy [3,4]. Even at low levels, ROS still acts as a second messenger in cellular signal transduction and homeostasis. The overproduction of ROS damages cellular biomolecules, such as proteins, lipids and nucleic acids, and induces apoptosis in multiple types of cells resulting in the induction of DNA damage and apoptosis [5,6]. In particular, Schwann cell apoptosis can enhance axonal degeneration, which is an important cause of peripheral neuropathy induction, due to reduced neurotrophic support from Schwann cells [7,8]. Therefore, the inhibition of excessive ROS generation is essential for the maintenance of the neural fiber regeneration function of Schwann cells. Mitochondria are the major organelles involved in ROS production by various oxidative stimuli. ROS-mediated oxidative stress activates the intrinsic apoptosis pathway, an active cell death mechanism, through the release of multiple death-promoting factors from the mitochondria to the cytoplasm and the activation of caspase-9 [9,10]. Activated caspase-9 triggers the activation of effecter caspases, such as caspase-3 and -7, which promotes the degradation of various substrate proteins important for cell survival; the Bcl-2 family proteins play an important role in this process [11,12]. On the other hand, most cells, including Schwann cells, have endogenous defense strategies to eliminate damages caused by excessive ROS production. Among them, the nuclear transcription factor erythroid-2-like factor 2 (Nrf2)/antioxidant response element (ARE) signaling is one of the critical antioxidant systems involved in the maintenance of the redox state for the defense of intracellular oxidative stress [13-15]. One of the ARE-regulated phase II detoxifying enzymes regulated by Nrf2 is heme oxygenase-1 (HO-1), which catalyzes the degradation of heme to biliverdin, carbon oxide, and iron [16,17]. In particular, HO-1 has most the abundant AREs in the promotion of genes regulated by Nrf2, and has been reported to be very important in preventing disease caused by oxidative stress [18,19]. Recent accumulated data have shown that antioxidant substances present in various natural products can be effective in suppressing and curing different diseases [20,21]. Among them, baicalein is one of the flavonoids found mainly in Radix Scutellariae, the roots of Scutellaria baicalensis Georgi., which has been used for a long time in the treatment of various diseases in Korea, China, and Japan [22,23]. According to the results of previous studies, baicalein has potent pharmacological activities including antioxidant, anti-inflammatory, and anti-cancer [23-26]. In addition, results from recent studies including those from our previous study , have shown that increased expression of Nrf2-dependent HO-1 by baicalein in various cell and animal models plays an important role in the inhibition of DNA damage and/or apoptosis by oxidative stress [26,28-31]. However, the potential mechanisms involved in protecting Schwann cells from DNA damage and apoptosis by oxidative stress are not yet clear. Therefore, in this study, we investigated the protective effect of baicalein on cellular injury by oxidative stress using HEI193 Schwann cells. For this purpose, we investigated the role of the Nrf2/HO-1 signaling pathway in the protective effect of baicalein on DNA damage and apoptosis in HEI193 cells by mimicking in vitro oxidation using a pro-oxidant agent (hydrogen peroxide, H2O2). The immortalized human vestibular schwannoma cell line (HEI193 cells) was provided by Dr. Hwan Tae Park (Department of Physiology, College of Medicine, Dong-A University, Busan, Republic of Korea). HEI193 cells were cultured in Dulbecco's modified Eagle's medium (WelGENE Inc., Daegu, Republic of Korea) containing 10% fetal bovine serum (FBS, WelGENE Inc.) and 100 U/ml penicillin and streptomycin (WelGENE Inc.) at 37˚C in humidified air with 5% CO2. Baicalein was purchased from Sigma-Aldrich Chemical Co. (St. Louis, MO, USA) and was dissolved in dimethyl sulfoxide (DMSO, Sigma-Aldrich Chemical Co.). The final concentrations were adjusted by dilution with a complete culture medium. The final concentration of DMSO did not exceed 0.1%, which did not show cytotoxicity. For the cell viability study, HEI193 cells were cultured in 96-well plates at a density of 1×104 cells per well. After 24 h incubation, the cells were treated with various concentrations of baicalein or H2O2 (1 mM, Sigma-Aldrich Chemical Co.) alone or pretreated with different concentrations of baicalein for 1 h before H2O2 treatment for 24 h. Subsequently, the medium was removed, and 0.5 mg/mL of 3-(4,5-dimethylthiazol-2-yl)-2,5-diphenyltetrazolium bromide (MTT, Sigma-Aldrich Chemical Co.) was added to each well and incubated at 37˚C for 3 h. The supernatant was then replaced with an equal volume of DMSO to dissolve the blue formazan crystals for 10 min. Optical density was measured at a wavelength of 540 nm with a microplate reader (Dynatech Laboratories, Chantilly, VA, USA). All experiments were performed in triplicate. The results are presented as the mean ± SD. Statistical significance was assessed by one-way ANOVA. A p value of < 0.05 was considered statistically significant. siRNA-mediated silencing of the Nrf2 gene was performed using siRNA duplexes purchased from Santa Cruz Biotechnology, Inc. (Santa Cruz, CA, USA). For transfection, the HEI193 cells were seeded (1x104 cells/ml) in 6-well culture plates and Nrf2-siRNAs were transfected into the cells using the Lipofectamine™ 2000 reagent (Life Technologies, Carlsbad, CA, USA) prior to treatment with H2O2 and baicalein according to the manufacturer's instructions. To extract whole-cell proteins, the cells were collected, washed twice with ice-cold phosphate buffered saline (PBS), and then lysed using a cell lysis buffer [25 mM Tris-Cl (pH 7.5), 250 mM NaCl, 5 mM Na-ethylenediaminetetraacetic acid (EDTA), 1% nonidet-P40, 1 mM phenylmethylsulfonyl fluoride, and 5 mM dithiothreitol] for 1 h before cell debris was removed by centrifugation. Protein concentration was measured using a Bio-Rad protein assay kit (Bio-Rad Laboratories, Hercules, CA, USA), and the same amounts of protein (30-50 μg) were separated by electrophoresis on sodium dodecyl sulfate (SDS)-polyacrylamide gels and transferred to polyvinylidene difluoride membranes (Schleicher and Schuell, Keene, NH, USA). The membranes were blocked with 5% non-fat dry milk for 1 h at room temperature and subsequently probed with the primary antibodies overnight with gentle agitation at 4˚C. The primary antibodies against Nrf2, Kelch-like epichlorohydrin-associated protein 1 (Keap1), poly(ADP-ribose) polymerase (PARP), Bax, Bcl-2, caspase-9 and caspase-3 were purchased from Santa Cruz Biotechnology (Dallas, TX, USA). The primary antibodies against histone variant H2A.X (γH2A.X) and p-γH2A.X were obtained from Cell signaling Technology (Danvers, MA, USA). Anti-HO-1 and anti-actin antibodies were obtained from Calbiochem-Novabiochem Co. (San Diego, CA, USA) and Bioworld Technology, Inc. (St Louis Park, MN, USA), respectively. After washing three times with Tris-buffered saline containing 0.1% Tween-20 for 5 min, the membranes were incubated with the corresponding horseradish-peroxidase-linked secondary antibodies (Santa Cruz Biotechnology) for 2 h at room temperature. The membranes were visualized by an enhanced chemiluminescence (ECL) solution (Amersham Corp., Arlington Heights, IL, USA) and exposed to X-ray films. The production of intracellular ROS was monitored using a cell-permeable fluorogenic probe, 5,6-carboxy-2',7'-dichlorofluorescin diacetate (DCF-DA). Briefly, the HEI193 cells were pretreated with 100 μM baicalein for 1 h and then cultured for 1 h in the presence or absence of 1 mM H2O2. The cells were harvested and stained with 10 μM DCF-DA (Sigma-Aldrich Chemical Co.) in the dark at 37°C for 15 min. The cells were then rinsed twice with PBS, and 10,000 events were immediately analyzed using a flow cytometer (Becton Dickinson, San Jose, CA, USA) with an excitation wavelength of 480 nm and an emission wavelength of 525 nm . Alkaline comet analysis was performed according to a previous research method to evaluate DNA damage . Following the termination of the treatment period, the cells were mixed with 0.5% low-melting-point agarose. The mixture was spread on precoated slides with normal agarose (1% in PBS) at 37°C and cooled to solidify using ice packs for 5 min. After the solidification of the agarose, the cells were immersed in a lysis solution [2.5 M sodium chloride (NaCl), 100 mM EDTA, 10 mM Tris, 1% Triton X100, and 10% DMSO (pH 10)] at 4°C for 1 h. The slides were placed in a gel electrophoresis apparatus containing 300 mM sodium hydroxide (NaOH) and 1 mM Na-EDTA (pH 13) for 30 min to allow the DNA to unwind, and were then subjected to electrophoresis for 30 min. After electrophoresis, the slides were rinsed three times with a neutralizing buffer (0.4 M Tris, pH 7.5) for at least 5 min each, dehydrated in absolute ethanol at 4°C, and allowed to dry. The cells were stained with 20 μg/ml of propidium iodide (PI, Sigma-Aldrich Chemical Co.) . Images were then captured using a fluorescence microscope (Carl Zeiss, Oberkochen, Germany) at ×200 magnification. Following the termination of treatment, the changes in the MMP (Δψm) were assessed using fluorescent, lipophilic, and cationic probes, as well as 5,5′,6,6′-tetrachloro-1,1′,3,3′-tetraethyl-imidacarbocyanine iodide (JC-1, Sigma-Aldrich Chemical Co.), as recommended by the manufacturer's guidelines. The cells were then collected and rinsed with cold PBS and then stained with 10 μM JC-1 for 30 min at 37°C in the dark. After washing with PBS to remove the unbound dye, the green fluorescence intensities from the JC1 monomer (with a 488 nm excitation) and the red fluorescence intensities from the aggregated form of JC1 (with a 575 nm emission) in the cells were measured using a flow cytometer (Becton Dickinson), following the manufacturer's protocol. To observe the nuclear morphological changes, the collected cells were fixed with 3.7% paraformaldehyde (Sigma-Aldrich Chemical Co.) in PBS for 10 min at 25°C and air dried. After washing with PBS, the cells were stained with 1 mg/ml of 4',6-diamidino-2-phenylindole (DAPI) solution (Sigma-Aldrich Chemical Co.) at room temperature for 10 min in the dark. Finally, the cells were washed twice with PBS, and the morphological changes in the nucleus were examined using a fluorescence microscope (Carl Zeiss) at ×400 magnification. The harvested cells were dissolved in a lysis buffer (10 mM Tris-HCl (pH 7.4), 150 mM NaCl, 5 mM EDTA, 0.5% Triton X-100, and 0.1 mg/ml proteinase K) for 30 min at room temperature. DNA from the supernatant was extracted by chloroform/phenol/isoamyl alcohol (24/25/1, v/v/v, Sigma-Aldrich Chemical Co.) and was precipitated by ethanol. DNA was then transferred to 1.5% agarose gel containing 0.1 µg/ml ethidium bromide (EtBr, Sigma-Aldrich Chemical Co.). Electrophoresis was then carried out at 70 V.
For the quantitative evaluation of apoptosis, the annexin V-fluorescein isothiocyanate (FITC) and PI dual staining technique were employed. Briefly, the cells were collected and the suspension was made in the binding buffer (Becton Dickinson). Subsequently, the cells were stained using an Annexin V-FITC Apoptosis Detection Kit (Becton Dickinson) for 20 min in the dark according to the manufacturer's instructions. After the final incubation, at least 10,000 cells were analyzed from each sample using a flow cytometer, and the degree of apoptosis was quantified as a percentage of the annexin V-positive and PI-negative (annexin V+/PI-) cells. To establish the experimental conditions, HEI193 cells were treated with a wide range of baicalein for 24 h, and cell viability was examined by an MTT assay. As shown in Figure 1A, the cytotoxic effect of baicalein was not induced at concentrations up to 150 μM, but the cell viability was gradually reduced in the treatment groups with minimum concentrations of 200 μM (Figure 1B). Therefore, the maximum concentration of baicalein to 100 μM was selected to study the cytoprotective effect of baicalein on cell damage by H2O2. To test the protective effect of baicalein on H2O2-induced cytotoxicity, HEI193 cells were treated with baicalein for 1 h before 1 mM H2O2 treatment and cultured for 24 h. Our results indicated that pretreatment with 50 and 100 μM baicalein significantly prevented the reduction of cell viability in H2O2-treated HEI193 cells (Figure 1B). 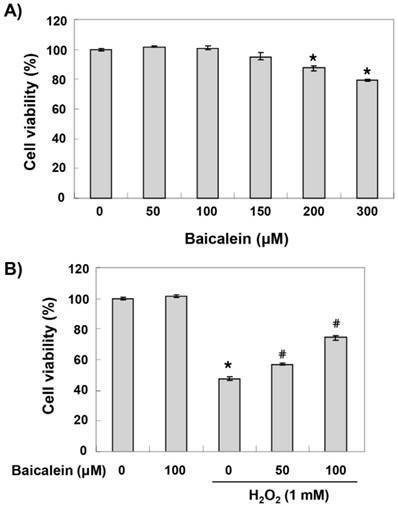 Effects of baicalein on the H2O2-induced cytotoxicity in HEI193 cells. Cells were treated with the indicated concentrations of baicalein for 24 h (A) or pre-treated with or without baicalein for 1 h, and then stimulated with 1 mM H2O2 for 24 h (B). Cell viability was assessed by the MTT reduction assay. The results are the means ± SD obtained from three independent experiments (*p < 0.05 compared with the control group, #p < 0.05 compared with the H2O2-treated group). The effect of baicalein on the expression of Nrf2 and its regulatory gene HO-1 in HEI193 cells was investigated because it is well known that the antioxidant efficacy of baicalein is related to the activation of the Nrf2/HO-1 signaling pathway [26-28,30]. Our immunoblotting results showed that the expression of Nrf2 and HO-1 protein gradually increased in a concentration-dependent manner with baicalein treatment. Conversely, Keap1 expression decreased with baicalein treatment (Figure 2A). In particular, phosphorylation at serine 40, which is important for the activation and stabilization of Nrf2, increased with baicalein treatment, demonstrating the baicalein activated Nrf2/HO-1 signaling in HEI193 cells. Furthermore, the expression and phosphorylation of Nrf2 were modestly increased in the H2O2-treated cells compared to those in the untreated control cells, although phosphorylation and expression were markedly elevated in the cells co-treated with baicalein and H2O2 (Figure 2B). In addition, HO-1 expression was significantly increased in the co-treated cells compared to the cells treated with baicalein and H2O2 alone, and the expression of Keap1 was further reduced (Figure 2B). We then transiently transfected HEI193 cells with Nrf2-siRNA to investigate the relationship between the activation of Nrf2/HO-1 signaling and the protective effect of baicalein against oxidative stress in HEI193 cells. 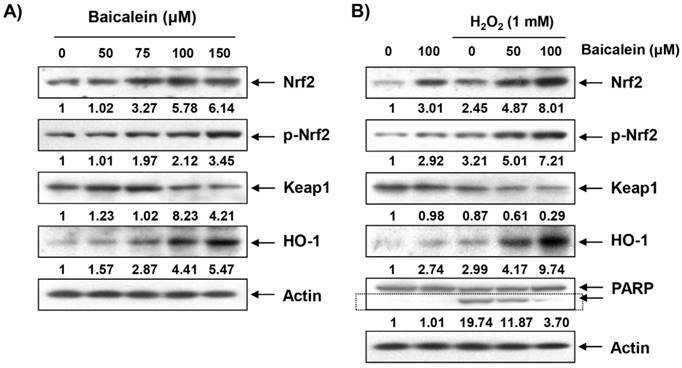 As shown in Figure 3A, the increased expression of Nrf2 and HO-1 in cells co-treated with baicalein and H2O2 was markedly abrogated when the HEI193 cells were transfected with Nrf2-siRNA; this provides evidence that the augmentation of HO-1 by baicalein was mediated by Nrf2. In addition, Nrf2 interference significantly eliminated the cell viability-improving effect of baicalein against H2O2 treatment (Figure 3B), showing that Nrf2/HO-1 signaling plays an important role in the protective effect of baicalein to oxidative stress in HEI193 cells. We then further evaluated the role of Nrf2/HO-1 signaling in regulating the protection of bacalin against H2O2-induced cytotoxicity using the zinc protoporphyrin (ZnPP), a chemical inhibitor for HO-1, and found that such protective effect was reversed by ZnPP (Figure 3C). To investigate whether the cytoprotective effect of baicalein on oxidative stress in HEI193 cells was correlated with antioxidant activity, the effect of baicalein on H2O2-induced excessive ROS production was investigated. Our flow cytometry results indicated that the level of ROS gradually increased with the treatment of H2O2, peaked at 1 h, and decreased thereafter (data not shown). However, the increase of ROS content in the HEI193 cells treated with H2O2 was reduced by the addition of baicalein, and the suppression of Nrf2 expression by siRNAs offset the inhibitory effect of baicalein on ROS production (Figure 4A). Induction of Nrf2 and HO-1 by baicalein in HEI193 cells. Cells were treated with the indicated concentrations of baicalein for 24 h (A) or pre-treated with or without baicalein for 1 h, and then stimulated with 1 mM H2O2 for 24 h (B). The cells were lysed, and equal amounts of the cell lysates were separated on the SDS-polyacrylamide gels and then transferred to the membranes. The membranes were probed with the indicated antibodies and the proteins were visualized using an ECL detection system. Actin was used as an internal control. The relative ratios of expression in the results of Western blotting are presented at the bottom of each result as relative value of actin expression. Involvement of Nrf2/HO-1 signaling in the protective effect of baicalein on H2O2-induced HEI193 cell cytotoxicity. Cells transfected with or without Nrf2-siRNA were pretreated with 100 μM baicalein for 1 h and then stimulated with or without 1 mM H2O2 for 24 h. (A) The cells were lysed and then equal amounts of cell lysates were separated on SDS-polyacrylamide gels and transferred to the membranes. The membranes were probed with specific antibodies against Nrf2 and HO-1, and the proteins were visualized using an ECL detection system. Actin was used as an internal control. The relative ratios of expression in the results of Western blotting are presented at the bottom of each result as relative value of actin expression. (B) The cell viability was estimated using an MTT assay. The results are the mean ± SD values obtained from three independent experiments (*p < 0.05 compared with the untreated group; #p < 0.05 compared with the H2O2-treated group; &p < compared with the H2O2- and baicalein-treated groups). (C) HEI193 cells were pre-incubated with or without 20 μM ZnPP for 15 min, then incubated with or without 100 μM baicalein for 1 h, and incubated with 1 mM H2O2 for another 24 h. After treatment, the cell viability was determined by an MTT assay. A comet assay, which is commonly used to assess DNA strand breaks , was performed to assess whether the inhibitory effects of baicalein on H2O2-induced viability reduction and ROS production were associated with DNA damage protection. As shown in Figure 4B, no smeared pattern of nuclear DNA was observed in the cells treated with baicalein alone as control cells. However, in the H2O2-treated cells, an obvious DNA tail was observed; these phenomena were reduced in the baicalein pretreatment condition, while the use of Nrf2-siRNA reversed the protective effect of baicalein. Consistent with the results of the comet assay, the phosphorylation of γH2A.X at serine 139, a biomarker of DNA double strand breaks , was greatly increased in the H2O2-treated cells, but was decreased by baicalein pretreatment. On the other hand, phosphorylation of γH2A.X, which was inhibited by baicalein, was maintained in the cells transiently transfected with Nrf2-siRNA (Figure 4C). Mitochondria are the major intracellular organelles of ROS production and the main target of ROS-induced damage. The overload of ROS leads to the loss of MMP, which is considered a characteristic of the initiation phase of the intrinsic apoptosis pathway [36,37]. We therefore examined the effect of baicalein on H2O2-induced MMP reduction in order to investigate whether the blockade of mitochondrial damage by baicalein was related to the protective effect of oxidative stress. As indicated in Figure 5A, the loss of MMP was markedly increased in the HEI193 cells exposed to H2O2, indicating that the depolarization of MMP was induced. 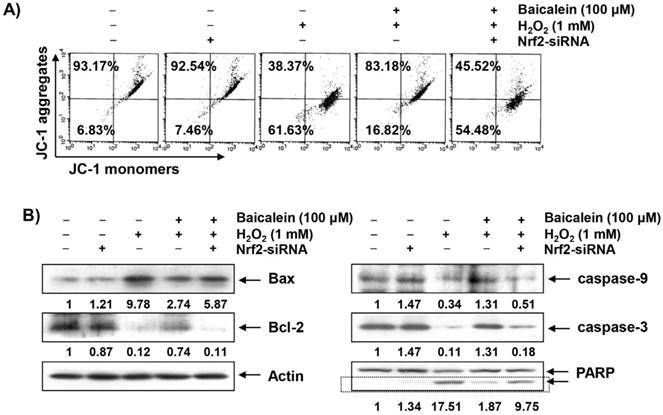 However, this phenomenon was significantly reduced in the cells pretreated with baicalein, and the inhibitory effect of baicalein on MMP reduction was no longer present in the cells transfected with Nrf2-siRNA. At the onset of the intrinsic apoptosis pathway due to mitochondrial dysfunction, changes in Bcl-2 family protein expression and degradation of substrate proteins such as PARP are accompanied by activation of the caspase cascade [11,12]. As shown in the immunoblotting results in Figure 5B, the expression of pro-apoptotic Bax was increased in the H2O2-treated cells, whereas the expression of anti-apoptotic Bcl-2 was decreased. In addition, the expressions of pro-caspase-9 and -3, representative initiator and executioner caspase in the intrinsic apoptosis pathway, respectively, were significantly decreased and the degradation of PARP was increased in the H2O2-treated cells. However, these changes by H2O2 treatment were relatively conservative in the baicalein-pretreated cells, and the protective effect of baicalein disappeared under the condition in which the expression of Nrf2 was blocked. Furthermore, chromatin condensation and DNA fragmentation, which are observed in cells with typical apoptosis, were clearly observed in the H2O2-treated cells, which were markedly attenuated by the pretreatment of baicalein (Figures 6A and 6B). 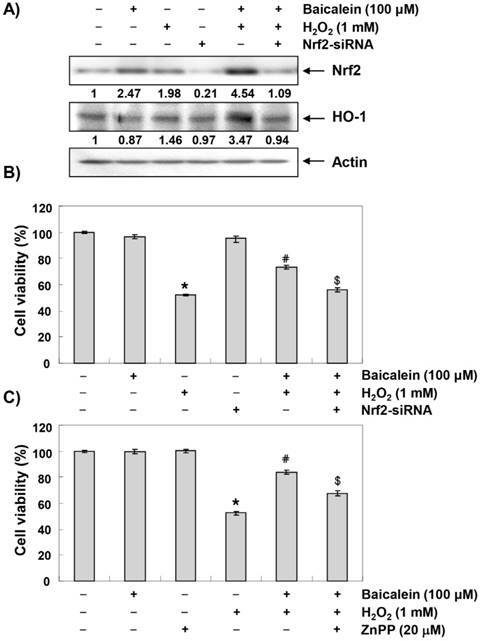 Supporting these results, we also confirmed that baicalein significantly inhibited the induction of apoptosis by H2O2 and the anti-apoptotic effects of baicalein were counteracted in the cells transfected with Nrf2-siRNA (Figure 6C). Protection of H2O2-induced ROS generation and DNA damage by baicalein in HEI193 cells. 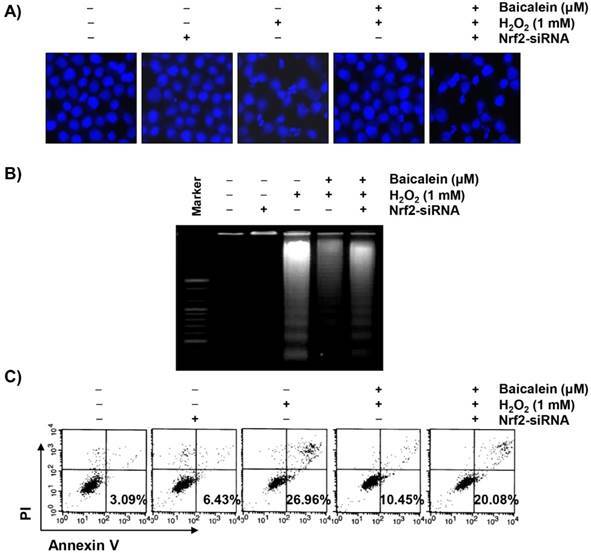 Cells transfected with or without Nrf2-siRNA were pretreated with 100 μM baicalein for 1 h and then stimulated with or without 1 mM H2O2 for 1 h (A) or 24 h (B and C). (A) The cells were incubated with culture medium containing 10 μM DCF-DA to monitor ROS production. The degree of ROS production was measured with a flow cytometer. The data are the means of the two different experiments. (B) To detect cellular DNA damage, a comet assay was performed, and representative photographs of the comets were captured using a fluorescence microscope (original magnification, 200×). (C) Equal amounts of cell lysates were separated on SDS-polyacrylamide gels and transferred to the membranes. The membranes were probed with specific antibodies against γH2A.X and p-γH2A.X, and the proteins were visualized using an ECL detection system. Actin was used as an internal control. The relative ratios of expression in the results of Western blotting are presented at the bottom of each result as relative value of actin expression. 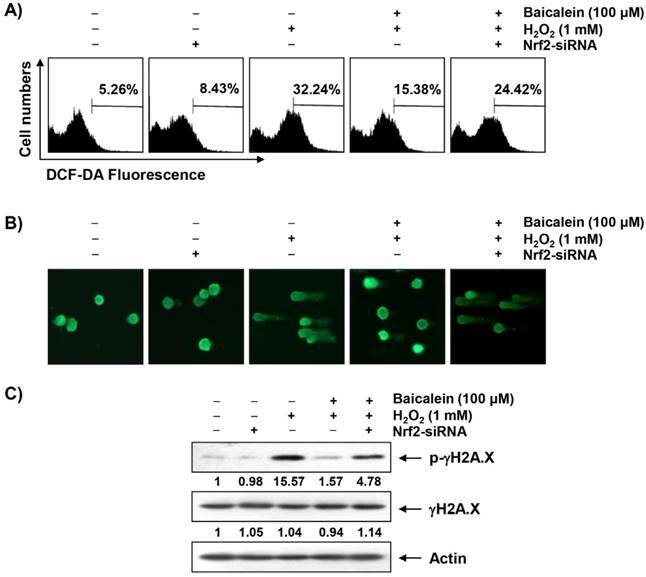 Attenuation of H2O2-induced mitochondrial dysfunction and changes of apoptosis-related proteins by baicalein in HEI193 cells. After transfection with or without Nrf2 siRNA, the cells were treated with 100 μM baicalein for 1 h and then stimulated with or without 1 mM H2O2 for 24 h. (A) The cells were collected and incubated with 10 μM JC-1 for 20 min at 37°C in the dark. The values of MMP were evaluated using a flow cytometer. The data are the means of the two different experiments. (B) The cellular proteins were separated by SDS-polyacrylamide gel electrophoresis, and then transferred to the membranes. The membranes were probed with the indicated antibodies. The proteins were visualized using an ECL detection system. Actin was used as an internal control. The relative ratios of expression in the results of Western blotting are presented at the bottom of each result as relative value of actin expression. Suppression of H2O2-induced apoptosis by baicalein in HEI193 cells. After transfection with or without Nrf2 siRNA, the cells were treated with 100 μM baicalein for 1 h and then stimulated with or without 1 mM H2O2 for 24 h. (A) The cells were fixed and stained with DAPI solution. The stained nuclei were observed using a fluorescence microscope (original magnification, ×400). (B) DNA fragmentation was analyzed by extracting genomic DNA, electrophoresis in a 1.5% agarose gel, and then visualizing by EtBr staining. (C) The cells were collected and stained with annexin-V and PI, and the percentages of apoptotic cells were then analyzed using flow cytometric analysis. The results are the means of two independent experiments. In the current study, we demonstrated the protective effect of baicalein, a flavonoid found mainly in Radix Scutellariae, on H2O2-induced oxidative stress in HEI193 Schwann cells. Moreover, we observed that baicalein promoted the activation of the Nrf2/HO-1 signaling pathway and the inhibition of Nrf2 activity eliminated the protective effect of baicalein, indicating that the beneficial effect of baicalein on HEI193 cells was mediated by the activation of at least the Nrf2/HO-1 antioxidant signaling. Although several articles have reported on the antioxidant efficacy of baicalein, this is the first study to show that the Nrf2/HO-1 pathway contributes to the protective effect of oxidative stress by baicalein on Schwann cells. Excessive ROS production by oxidative stress is one of the mechanisms that lead to apoptosis associated with mitochondrial dysfunction [8,38]. In particular, Schwann cells are the main target cells of oxidative stress in the initiation of neurodegenerative diseases, and many studies have shown that the use of natural antioxidant properties is sufficient to prevent functional damage of these cells to oxidative stress [15, 39-41]. In this study, we confirmed that baicalein significantly protected HEI193 cells from oxidative stress. We also demonstrated that baicalein could block DNA damage due to oxidative stress through the inhibition of DNA tail formation and γH2A.X phosphorylation using comet and immunoblotting assays, which were associated with decreased ROS production. Similar to the results of several previous studies [27,29,31], these results suggest that the inhibition of excessive ROS production by baicalein contributes to the attenuation of H2O2-induced proliferation inhibition and DNA damage in HEI193 Schwann cells. In general, the apoptosis inducing pathway can be divided into mitochondria-dependent intrinsic signaling and death receptor-mediated extrinsic apoptotic signaling pathways. Apoptosis due to excessive ROS production is a mitochondrial-dependent pathway leading to the loss of MMP, the first event that begins through mitochondria membrane permeabilization, which is recognized as an indicator of mitochondrial damage [36,42]. Reduced MMP induces the release of death-promoting factors such as cytochrome c from the mitochondria to the cytoplasm, and cytochrome c in the cytoplasm forms apoptosomes by binding to apoptotic protein activating factor 1 (Apaf-1) [9,10]. Apoptosomes sequentially activate caspases-9, a potent stimulant of the intrinsic apoptosis pathway. Activated caspase-9 accelerates the activation of effector caspases such as caspase-3 and -7 to destroy the various substrate proteins necessary for cell survival and eventually inducing apoptosis. Additionally, pro-apoptotic proteins, such as Bax, belonging to the Bcl-2 family members, can translocate to the mitochondria, destroying the MMP and opening mitochondrial pores to release cytochrome c, while anti-apoptotic proteins such as Bcl-2 act in the opposite way [11,12]. Therefore, the balance between the pro-apoptotic and anti-apoptotic proteins in Bcl-2 family members is considered to be a controlling factor of apoptosis induction. As can be seen from the results of this study, baicalein suppressed the H2O2-induced decrease in MMP in the HEI193 cells, and the increase in Bax/Bcl-2 ratio after H2O2 treatment was also effectively reversed by baicalein co-treatment. In addition, the decreased expression of pro-caspase-9 and -3, which means they were activated, by H2O2 treatment was restored to the control level by pretreatment with baicalein; the degradation of PARP, a biochemical hallmark of apoptosis, was also inhibited. Moreover, through nuclear morphological changes, DNA segmentation, and flow cytometry analysis, we confirmed that H2O2-induced apoptosis was suppressed by baicalein. These results imply that baicalein was able to weaken apoptosis through the preservation of mitochondrial function while eliminating ROS in HEI193 Schwann cells. Accumulated evidence indicates that Nrf2 plays an important role in protecting against oxidative damage by promoting the expression of antioxidant enzymes in most cells, including Schwann cells [15,16,18,19]. For example, it has been reported that the activation of Nrf2 by several natural products protects apoptosis by oxidative stress in Schwann cells, which is associated with the inhibition of ROS production [15,43]. Moreover, recent studies have shown that the up-regulation of HO-1, a representative enzyme regulated by Nrf2, can counteract oxidative stress in Schwann cells, suggesting that HO-1 may be an attractive therapeutic target for peripheral neuropathy associated with Schwann cell damage [15,44]. Under physiological conditions, while Nrf2 binds to Keap1 and is sequestered in the cytoplasm, when subjected to a situation that responds to oxidative stress, Nrf2 is disassociated from Keap1 and then translocates to the nucleus to activate the transcription of the cytoprotective genes including HO-1 [17,18]. In this process, phosphorylation of Nrf2 is accompanied by upstream kinases, and the phosphorylation of Nrf2 is an essential process for the transcriptional activation of its target genes [18,19]. As shown in this study, the expression and phosphorylation of Nrf2 were greatly increased in the HEI193 Schwann cells treated with baicalein, but the expression of Keap1 was decreased. Therefore, we investigated whether the activation of the Nrf2/HO-1 antioxidant pathway is involved in the protective effect of baicalein on oxidative stress in HEI193 cells and found that Nrf2 knockdown by Nrf2-siRNA transfection markedly blunted the baicalein-induced HO-1 upregulation and weakened the protective effect of baicalein on H2O2-induced ROS production. In addition, the ability of baicalein to protect DNA damage and apoptosis by H2O2 disappeared in the presence of Nrf2-siRNA. Collectively, these data support the hypothesis that the activation of Nrf2/HO-1 signaling pathway may contribute to the protective effect of baicalein on oxidative stress in HEI193 Schwann cells. In conclusion, the present study showed that baicalein protects against the H2O2-induced loss of viability, ROS generation, DNA damage, and apoptosis through activation of Nrf2/HO-1 signaling pathway in HEI193 Schwann cells. Although studies on mitochondrial damage-associated energy metabolism and Nrf2 upstream signal molecules are needed, these findings suggest that baicalein can provide neuroprotection of peripheral nerves by potentially protecting the Schwann cells from oxidative stress-mediated damage. This research was supported by Basic Science Research Program through the National Research Foundation of Korea (NRF) grant funded by the Korea government (2018R1A2B2005705 and 2016R1A5A2007009).